Water is the world’s most precious resource of all. It’s life – it’s prosperity – it’s a commodity we must respect. We should share it’s beauty and all that flows from it with our children and work together to protect and manage this fragile resource. 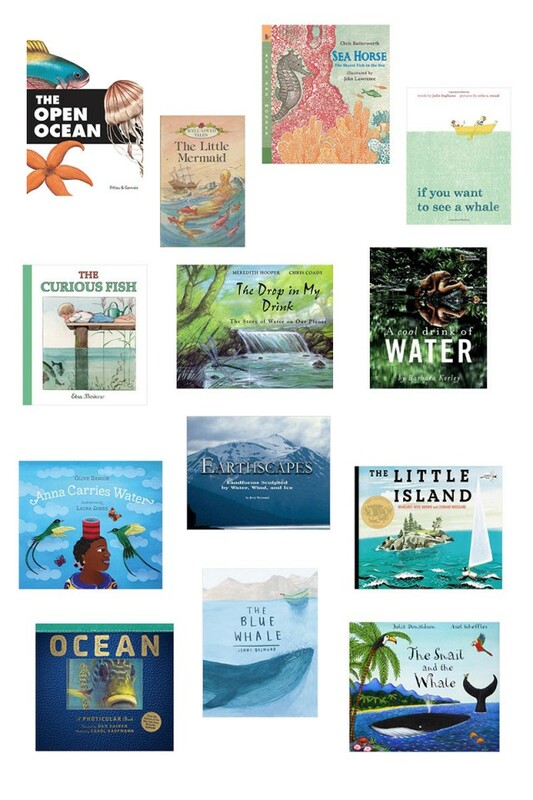 I’m thrilled to share with you some of our favourite water inspired books which I hope will open up the dazzling and mysterious world which our waters have to offer and deepen our appreciation of our world of water. A Cool Drink Of Water, By Barbara Kerley: An Italian boy sips from a fountain in the town square. A hiker takes a refreshing drink from a mountain stream. Black-robed women in India stride gracefully through a field with brass water jugs balanced on their heads. Whether they haul it home from a communal tap, or get it out of their kitchen faucet, people all around the world are unified by their common need for water. A beautiful and educational picture book that combines striking National Geographic photographs with a poetic text to show how people in various cultures use and conserve the world’s most vital resource. Anna Carries Water, by Olive Senior: Anna fetches water from the spring every day, but she can’t carry it on her head like her older brothers and sisters can. This is a charming and poetic family story set in Jamaica, showing young readers the power of determination, as Anna achieves her goal and overcomes her fear. The Drop In My Drink, by Meredith Hooper and Chris Coady: Water is a part of your everyday life. But when you fill a glass with water, do you ever stop to wonder where it comes from? Water was present during the Earth’s dramatic formation billions of years ago. It has carved out canyons and worn away coastlines. It has spent thousands of years at the bottom of an ancient sea, and traveled for just a few hours as vapor in a cloud. It has been part of millions of organisms over time, including a worm, a Tyrannosaurus rex, even an Egyptian princess. In this engaging science picture book, water takes on fascinating new significance as readers discover the amazing complexity of a substance so familiar we often taken it for granted. Includes a detailed depiction of water cycles, amazing facts about water, plus important environmental information. Earthscapes, by Jerry Wermund: Landforms sculpted by water, wind and ice is a study of geology through poems and color photographs that lead the reader to visit frozen mountains, wander seashores, roam streams and rivers, and venture into parched deserts. The Curious Fish, by Elsa Beskow: A charming novel in the classic Beskow style, teaching us a humble lesson about intuitive right from wrong, and that all life forms how great or small are valuable. The Little Island, by Margaret Wise Brown: A classic book about a little island, that despite being surround by water, is not isolated at all, a beautiful message that everything is connected, told subtly through flora, fauna and the changing seasons. Sea Horse, by Chris Butterworth: A delightful tale entwined with many amazing facts about one of the most intriguing creatures in the sea. If You Want To See A Whale, by Julie Fogliano: Julia Fogliano is a delight. Her style and colour palette makes for dreamy story books. We own a lot of Fogliano’s books but this one has to be a favorite. Helena very much relates to the little boy who patiently waits for the whale to arrive – just like she did when we once went whale watching. The Open Ocean, by Francesco Pittau: Helena appreciates and remembers facts and once she’s excited about a topic there’s no stopping her. We picked up this book about a month ago when she was learning about oceans in school and it was just the book she needed. Pittau manages to capture the energy of the ocean through the elegant images and asks us to guess the sea creature, flipping over to discover the answer. The Little Mermaid by Hans Christian Andersen: A beautiful classic story which for older children can open up into quite a different discussion with it’s not so happy ending. A great book to teach empathy and the illustrations rather reflective of the underwater world. The Blue Whale, by Jenny Desmond: A stunningly illustrated book which encompasses the beauty and awe of whales. Told in a simple straightforward manner the text is purely factual. Ocean, by Dan Kainen: A magnificent book with images transforming you in to a 3D underwater world. This book will grab the attention of any reader. The Snail and the Whale, by Julia Donaldson: As a family we adore Julia Donaldson. Her books are such a hit with my girls. It’s the notable and well-loved rhyming couplets with which Donaldson writes so fluidly, capturing young listeners from the beginning to end. The Snail and the Whale is a wonderful tale about friendship between the tiny snail and the great big whale. This entry was posted in G E N E R A L and tagged books, children's books, vanessa gerbrandy, water.